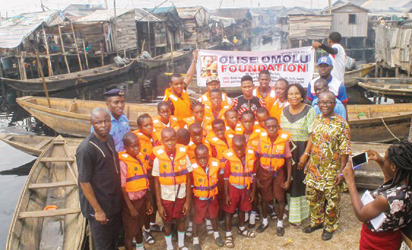 Emotions ran high for residents of Sogunro community, Iwaya, Yaba suburb of Lagos, when Mr Sunday Omolu of Olise Omolu Foundationâ€™s Â little kind gesture to give life jackets to pupils who access education on boats, drew the attention of the Lagos State Waterways Authority, LASWA, to not only visit the community for the first time, but also make additional donations of life jackets. Recall that on June 8 this year, Vanguard had published an exclusive story of Sogunro , a community where pupils accessed education on boat without life jackets, and where there existedÂ no visible government presence. The presentation of life jackets to pupils of the only three primary schools; Sunset International Nursery and Primary School; Climax Nursery and Primary School and Living Rock International SchoolÂ by Mr Sunday Omolu founder of Omolu foundation, in company of his wife; and Mr Emmanuel Oluwadamilola, Managing Director, LASWA who was represented by Mr Ibrahim Famuyiwa, Operations Officer, LASWA, were received by Bale Johnson Agojete one of the Balesâ€™ of the community; proprietors of the schools, Mr Emmanuel Oke; Mr. Kola Zachariah Olufemi, and Mr John Phinehas,Â head teacher,Â Living Rock International School; Mr Paul Dandotoho, Parents Teachers Association, PTA Chairman ; and Rev. Olusegun Wusu among others. Expressing delight, 12 year old Basic two pupil Â Kotundame DamiÂ of Climax Nursery and Primary School who came from Sogunro Waterside daily, said that the fear of tide of the river during rainy season most times made her abscond from school as there were no lifeÂ jackets to protect her and her school mates from the torrents of rain and scorch from the sun. The Basic two pupil added that the harsh living conditions of residents in her community were reasons why most of them stay so long in primary school. Asked why at her age she was still in Basic two, 12 years Dami has this to say, â€œAnother thing that makes us miss or stop school is the inability of our parents to pay the N100 daily fees. And since, we do not have a free public school; we stay at home whenever our parents do not give us our daily school fees. â€œexpressed Dami. Speaking at the reason behind the donation, Mr Omolu said his reading of Vanguardâ€™s story on Sogunro gave him sleepless night, which eventually led him to sought help from his friends for the provision of life jackets for children who desired great future but may be hampered by circumstances. â€œWhen I came about the Sogunro story on Vanguard, I cried at the height of suffering the pupils go through for them to become somebody in future. With the help of my wife and my friends, and Mr Japheth Alakam of Vanguard, we bought these life jackets for pupils here. â€œHowever, this is the beginning of great things to come for these children as my foundation with assistance from my friends will also provide other amenities for these leaders of tomorrow. As there is no justification for any child to be deprive basic education,â€� added Mr Omolu. On his part, Mr Oludamilola , MD LASWA who spoke through Mr Famuyiwa said Lagos was poised to reduce instances of sea accidents which in recent times have claimed many lives. MD LASWA who commended Mr Omolu for carrying Lagos state along in his noble gesture and Vanguard for discovering the Sogunro said continuous efforts will be put in place to see that members of the community strictly use the life jackets when crossing the river. His words, â€œ I am highly impressed that Mr Omolu foundation and for Vanguard write up which brought light to this place. However, we not only bring life jackets for the pupils but for adults so as to protect lives and reduce the mishap of sea transport.â€� Said MD LASWA. Mr Oludamilola who added that the presentation of the life jackets was sponsored by Total oil company called on the community leaders that the jackets should be judiciously utilised for the good of everyone and not necessarily as a private property. His words, ” These jackets should be used always whenever you want to cross the river to land.Â And it should never be converted to personal property rather, it should serve as a means to secure the lives of everyone.Â This is because, Lagos State government will henceforth pay regular unscheduled visits to you. ” added the lagos state official. In the same,Â Mr Oke,Â one of the proprietors who could not control his emotions said that divine help has come to Sogunro through the effort of Vanguard. His words, ” Today, we have witnessed a new thing as our pupils that most time ran away from school due to the harzard of the sea can proudly attend classes unhindered.Â And I want to thank you Vanguard for telling the story of Sogunro. ” praised the teacher. The post Tears of Joy as Sogunro children get life jackets appeared first on Vanguard News.